Innovation is becoming a key issue when dealing when thinking in ways to overcome today's most critical challenges related to Sustainable Development; and complementarily Sustainability issues are becoming a most relevant focus regarding innovation everywhere in the world. This journal, organized by the Center for Future Studies NEF/PUCSP, seeks to publish research papers related to Innovation and Sustainability that may contribute most to these areas; based on the close collaboration and partnership among the Wuhan University of Technology of China, the Yamaguchi University of Japan, the Tilburg University of the Netherlands, Vassa University of Applied Sciences of Finland, The Universiti of Teknologi of Malaysia and the PUCSP from Brazil among others; that have being working together organizing the yearly International Conferences on Innovation and Management (ICIM). It counts also with support from the international research network of the Millennium Project. The Journal RISUS does´nt charge a fee to publish articles. The publication is free. The articles submitted to RISUS - Journal on Innovation and Sustainability will be sent to two reviewers (double blind review), guaranteeing secrecy and anonymity both of the author (s) and of the referees. The judges will analyze the originality of the subject, the contribution to the area, the presented treatment, the clarity of the essay and the normalization of the citations and bibliographical references. If one of the opinions is positive (with or without modifications) and another is negative, the Journal will use a third evaluator to solve the deadlock. Only articles approved by at least two reviewers will be published. 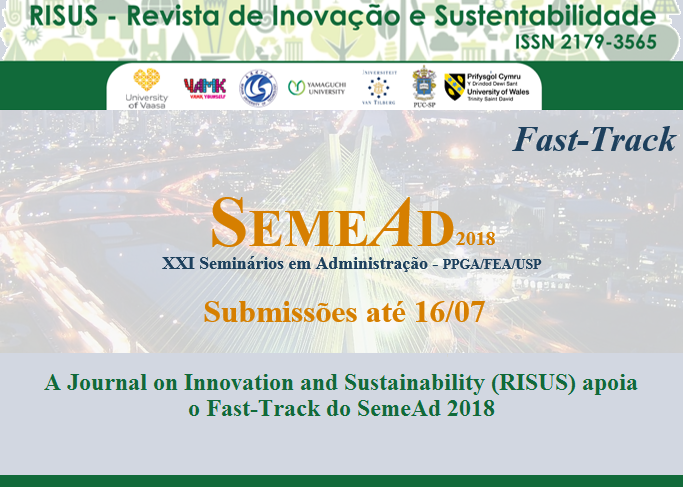 Os artigos submetido à RISUS - Journal on Innovation and Sustainability serão encaminhados para dois avaliadores (double blind review), garantindo sigilo e anonimato tanto do(s) autor(es) quanto dos pareceristas. Os julgadores irão analisar a originalidade do assunto, a contribuição para a área, o tratamento apresentado, a clareza da redação e a normalização das citações e referências bibliográficas. Caso um dos pareceres seja positivo (com ou sem modificações) e outro seja negativo, a Revista recorrerá a um terceiro avaliador para solucionar o impasse. Somente serão publicados os artigos aprovados por pelo menos dois pareceristas. 2. Reviewers inform and give feedbacks, to authors as well as editor, regarding weeknes and strengths of papers being submitted. 2.2 Os avaliadores informam os pontos fortes e fracos do paper submetido, fornecendo informações tanto aos autores como para o editor. There viewing process regularly takes at most 3 months and time for publication about 4 months each time. O processo de avaliação gira em torno de no máximo 3 meses e o tempo de publicação em média 4 meses por edição. For regular issues on the first day of March, June and September. Other dates may be considered for special issues. All the papers are open source and avaliable on PDF Format. The RISUS is currently welcoming submissions.